Ali Ulvi Oğur, a retired teacher, have been put in pre-trial detention by a Turkish court on accusations of disseminating the propaganda of the Kurdish Democratic Union Party (PYD) and the Kurdistan Workers’ Party (PKK) in social media messages concerning a Turkish military operation in the Afrin region of Syria. 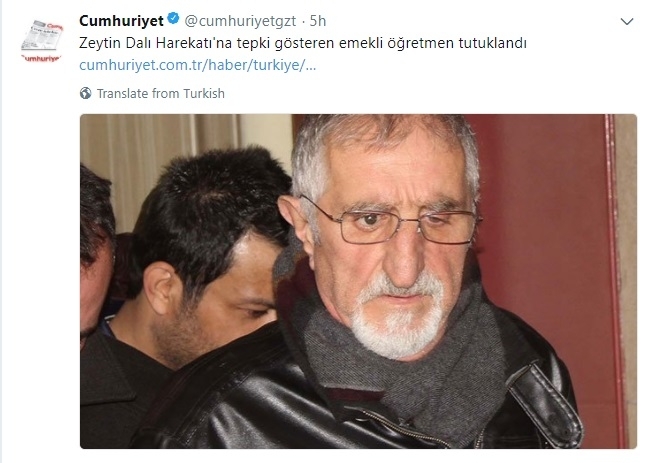 According to the Cumhuriyet daily, Kayseri police detained Oğur early on Tuesday due to his tweets criticizing the Turkish government for the recent military operations in Syria. The retired teacher was sent to prison by a Kayseri court later the same day.